Having spent years burnishing his credentials as Africa’s peacemaker, Burkina Faso’s longtime ruler Blaise Compaoré may not get a chance to broker a peace deal in his own country. On Thursday, the army announced it was seizing power after protesters angered by Compaoré’s bid to extend his 27-year rule stormed the parliament building in the capital, Ouagadougou, and set it ablaze. Lawmakers earlier abandoned a planned vote that would have allowed Compaoré to seek a fifth term at the helm of the landlocked West African country, where more than half of the 14.7 million inhabitants have known no other ruler. In a hastily arranged press conference, the army said it was dissolving the government and the National Assembly, and creating a transitional body to run the country. There was no mention of the 63-year-old president. Soon after, Compaoré resurfaced in a brief televised address, in which he welcomed the army’s “patriotic action” and vowed to stay in power. He said he would begin negotiations with the opposition to end the crisis, promising to hand over power once the transitional government had finished its term. On paper, crisis talks should provided familiar territory for the man often described as Africa’s peacemaker. But by nightfall it was still unclear whether the army would give him a chance to prove he can deliver at home as he has done abroad. A former coup leader, Compaoré has steered an unlikely course from regional troublemaker to peace broker. “Handsome Blaise”, as he is known to Burkinabes, was aged just 36 when he seized power in a putsch, replacing his erstwhile companion Captain Thomas Sankara, who was killed in mysterious circumstances. Both had allegedly been trained at Colonel Muammar Gaddafi’s “World Revolutionary Centre” in Libya, whose other pupils included Liberian warlord Charles Taylor and his proxy in Sierra Leone, Foday Sankoh. Years later, Compaoré was accused of sending arms and mercenaries to fight UN peacekeepers in Sierra Leone – in exchange for diamonds. The Burkinabe leader has also been linked to a 2002 rebellion in neighboring Ivory Coast, which left thousands dead and split the country in two.Compaoré has denied any wrongdoing. Ultimately, the Ivorian crisis gave Burkina Faso’s strongman a chance to reinvent himself as a mediator. Diplomatic efforts to end the bloodshed in Ivory Coast, home to three million Burkinabes, resulted in a 2007 peace deal signed in Ouagadougou. Soon, the capital of Burkina Faso became the de-facto hub of regional peace talks, successively hosting feuding delegations from conflict-torn Togo, Guinea and Mali. While neighboring countries were rocked by coups and rebellions, Compaoré’s tight grip on his country turned the former French colony into a beacon of stability in an otherwise troubled region. This in turn bolstered the president’s credentials as a peacemaker – and largely exonerated him from Western criticism over his dubious democratic record. 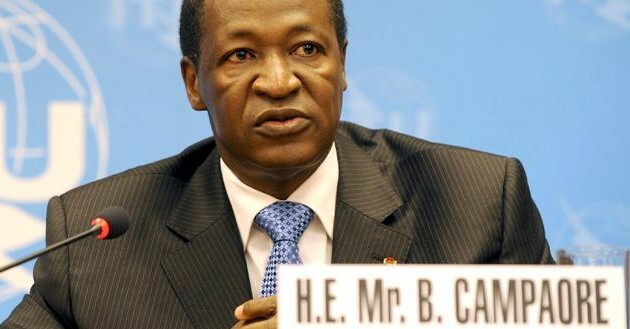 Compaoré has also been described as a point man for negotiators seeking the release of Western hostages held by Islamist groups and other rebel militia in the restive Sahel region. In 2009, talks led by Compaoré helped secure the release of two Canadian envoys for the United Nations, Robert Fowler and Louis Guay, who were held captive in Niger for 150 days. Incidentally, a decade earlier Fowler had penned a scathing UN report that publicly accused the Burkinabe ruler of funding Angola’s bloody 1990s civil war. Whether stirring crises abroad or soothing them, Compaoré has succeeded in giving Burkina Faso a prominence neither its size nor its economy could match. Failure to improve the lot of his countrymen has gradually eroded his support and emboldened the country’s fledgling opposition. Even by regional standards, Burkina Faso remains a poor country, prey to recurrent droughts and fluctuations in the price of cotton, the economic mainstay for many Burkinabes. Buoyed by the Arab Spring protests that swept North Africa, students took to the streets of Ouagadougou in 2011 in protest at corruption and declining living standards. The protesters were soon joined by mutinous soldiers demanding better wages. While the mutinies were successfully quelled, the simmering discontent expanded into full-blown outrage last week when Compaoré confirmed he would seek re-election next year. France, which has a military base in the country, has expressed concern over the president’s plans to change the constitution in order to seek a fifth term in office. In a statement released this week, France’s Foreign Ministry stressed Burkina Faso’s “key role in guaranteeing regional stability and conflict resolution”, and urged the country to “envisage its own future in a peaceful and consensual manner”. Paris is said to have backed Compaoré to head the International Organisation of French-speaking countries (OIF) when its current leader steps down later this year, an offer the long-time ruler reportedly turned down. Judging by Thursday’s events, it appears a sizeable share of the people think it is high time “Handsome Blaise” retired. Source — France 24 & BBC News video.